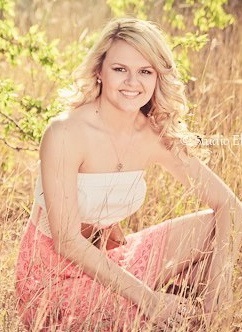 Courtney comes to Austin from the small town of Skidmore, Texas. She currently studies fashion design at the University of Texas at Austin. Courtney loves anything that involves fashion and describes her artistic style as girly and bright, but also edgy and fierce. This is Courtney’s first time participating as an artist for Art Bra Austin and she is thrilled at the opportunity to create a piece for a cause that is so close to her heart. The inspiration of this art bra’s design came from Courtney’s mother, who once said, “No matter what you go through in cancer, still sparkle like a diamond and you will always be as beautiful as a rose.” Courtney decided to incorporate her love for rhinestones and sequins to create the art bra’s ‘sparkle’. She then attached light pink roses along the art bra’s trim to symbolize breast cancer and honor her mother’s words. A string of pearls delicately drapes from the front of the art bra and wraps around the torso to connect in the back. To complete the piece’s feminine and cheerful look, Courtney created a matching tutu out of tulle, and sewed an elastic sequin piece around its waistband for added comfort. “Never Let Cancer Dull Your Sparkle” was created in honor of Courtney’s mother, Brandy Leonard, who was diagnosed with breast cancer a year ago, but is now cancer-free.